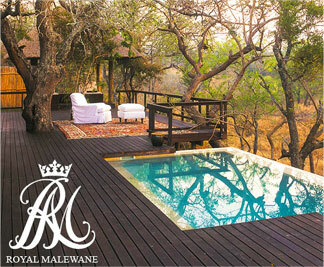 Wilderness, luxurious accommodation and decadent dining are the signature features of Royal Malewane. The very first Chaîne des Rôtisseurs Blazon safari lodge in the African bush, Royal Malewane offers a boutique journey with colonial antiques to indulge at home and close-up game sightings as you venture further afield. 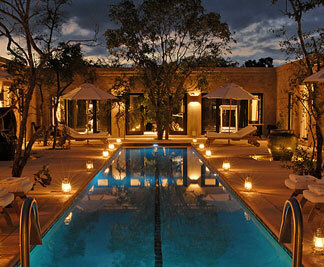 A wine cellar, spa and pool offer additional respite for a relaxing get-away-from-it-all. 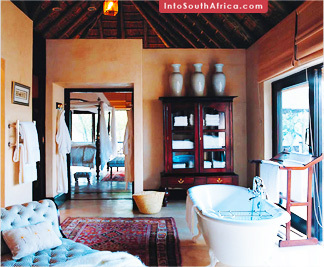 A luxury boutique safari lodge located in the Thornybush reserve of Kruger National Park. 6 suites beautifully furnished with original antiques, plus two ultra-deluxe Royal Suites (Total: 8 suites). 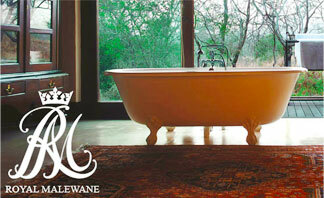 All rooms feature a luxuriant bathtub, his & her vanities and designer amenities. The Regular Suites at Lodge (2 person occupancy) have wooden viewing decks, a rim-flow pool and thatched pavilion for private wildlife viewing from your room. 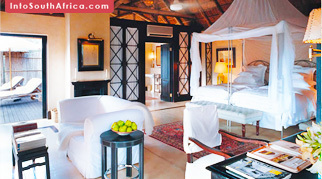 The Royal Suite and The Malewane Suite each accommodate upto four guests in two luxuriously-appointed en-suite bedrooms. Booked individually, or together, each spacious suite has a private lounge and dining room. 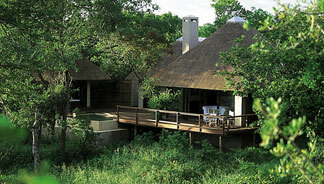 The suites feature private pools on large decks with wilderness gazebos. Complimentary services with your Royal suite reservation include a private butler and chef, private game drives with an exclusive guide and up to 4 complimentary massages per suite per day. 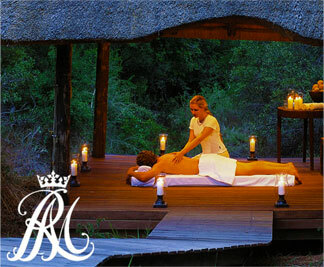 Royal Malewane Bush Spa offers luxurious therapies. The Main Pool lounge offers a peaceful respite. 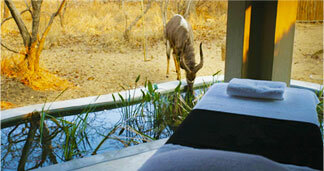 Big-Five wildlife encounters on twice-daily game drives. Special offers available for exclusive lodge charter by individual family groups. The Whale Watching in Hermanus occurs from September through November. By October, the Southern Right Whales peak in the Walker Bay area where they mate and calve. Another local attraction is the World's first Whale Crier, keeping all informed on the whereabouts of the whales with the sound of his kelp horn - asound that is the charming characteristic of the sleepy seaside resort of Hermanus during the whaling season. Extraordinary international award winning Pinot Noir is produced a few miles from Hermanus and visitors are welcome for wine tasting to these estates. A class apart, no other hotel in the Cape Winelands can boast the luxury, elegance and cuisine that La Residence calls its own. Encapsulating priceless antiques and a one-of-a-kind art collection, this light and airy villa resides on a working privately-owned vineyard, just a couple minutes away from the busting bistros, elegant galleries and pretty chocolatier shops of Franchhoek Valley. Every fashionable suite in this elegant boutique hotel overlooks mountains, vineyards and a remakably landscaped pool pavillion, affording privacy and exclusivity in rich surrounds. Excellent cuisine and, ofcourse, a comprehensive cellar featuring the region's finest await your indulgence. A must experience for gourmands and discerning guests looking for an authentic South African food, art & culture experience. 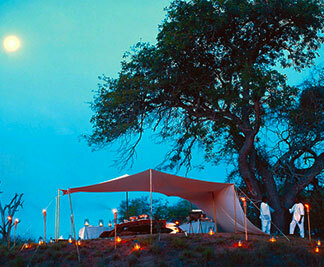 Located in Singita Private Game Reserve, South Africa. Featuring accommodation in a luxury safari suite at Royal Malewane, roundtrip local airstrip transfers, daily breakfast, all meals, drinks, wine and complimentary laundry service. *Details on application for package. Please select travel dates by clicking on a departure and return day in the calender below. Celebrating? We’ll plan on something special for you. Select your vacation below.